These dudes have just been smashing countries lately, and they are really, really fun to watch. Even for soccer. Ooooh this is going to hurt some feelings. Can a mod sticky this? I love how they are attacking. The countries they've played in this goal cup are terrible offensively though. The defense is still a really big problem. It'll be nice when they get Altidore, Dempsey and Bradley back. I've been really impressed with Eddie Johnson though. Donovan has been fantastic. We need a young striker in the worst way. Strikers are to the USMNT as Franchise QBs are to the KC Chiefs. Man, Jurgen has really turned this team around. Pretty remarkable. Gold cup game vs Panama on right now on Fox. Game is at Soldier Field in Chicago. not broadcasting it in HD or does it just look like crap? I'm on an Antenna and it's coming in HD. I hate Fox Soccer channel so much. Better make it worth it for Sporting having lost Besler the last few games. Need a better shot than that. How did he not get a shot off there? That would have been a sure goal. need more quick deep shots like Bedoya's. EJ shoulda taken one when he tried to get it to Donovan. Getting so jazzed about WC2014, you guys. Can't wait. This team is so fun. 3. We attack, even when we're up. I love this style of play. How many times in the past did we see a US team go up 1-0....play conservative, and give up late goals (for a tie)? Let's hope this carries over to the big-time games and the WC. Tampa Bay and Orlando City will absolutely own them...before Orlando City gets in the top league that is. I'm not so sure about that. Those teams don't get the fan fare that our team will. People love soccer here. That is silly. OC has been supported so well they are basically a shoe in to be the next MLS team. They average about 8k fans a game for an NASL team. When has Jacksonville ever cared about anything? I think a team in JAX is great but the idea that it will trump a place that has actually been doing it right feels extremely cart before horse. You're talking about Orlando? Well maybe not Orlando but you can at least admit South Florida professional teams aren't known for their fan support. Well that's fine if they get into the MLS. I think they want to get it to 16 teams so we still got a shot anyway. I'll be supporting this Jax team though as I have always said to friends and family that we should get a soccer team. It is possible they have looong way to go though as far as being set and getting a stadium plan as well as convincing Miami to care. Haha. It could happen but OC is next in the pipeline. Yes. Orlando has some of the best non MLS support around. Kudos to Bees and the boys for the Gold Cup. I'm so very happy to see the US "B" squad dominate in such a manner. The implosion by Mexico has the Mexican side of me a bit bummed. Otherwise, good tourney and the best part is we are THAT MUCH CLOSER TO THE WORLD CUP!!!!!!!!!!!! Aron Johannsson has decided to play for USMT. Don't know a ton about him, but everything I read said he's an exceptional talent. Only 22 and is a striker. didn't know anything about that kid until now. Let's hope he can fill a big gaping void we have. Having Klinsmann as the coach has really paid dividends in getting players with dual citizenship to play here. This is the best the USMNT has looked in a very long time. Defense is what will hold us back in WC2014. Any chance Costa Rica beats Mexico and US lays down against Panama? US won't lay down...suppose there is a chance they **** up on the road but it is doubtful. As far as CR\Mexico you can flip a coin. As soon as I say this Panama scores. I went to the game last friday. It was off the chain. THAT WAS ONE OF THE MOST INSANE SERIES EVENTS I HAVE EVER SEEN IN THE HISTORY OF MY LIFE AS A MAN WATCHING SPORTS. The Panamanians had every opportunity to play bunker ball.. it's like they expected us to play pass with them because we hate the Mexicans. 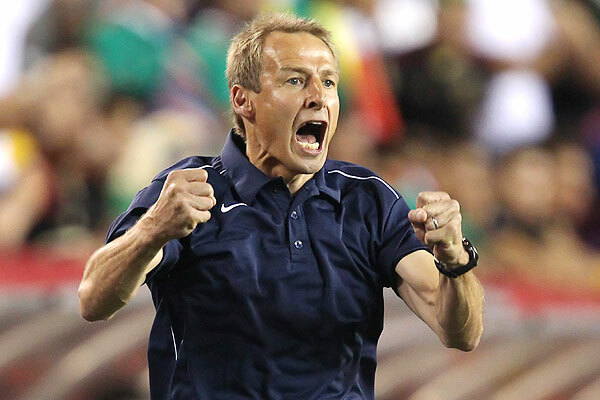 Klinsmann doesn't give a **** what the implications of a win or loss are, he's a goddamn head coach. If you play soft, you'll get scored on. Period. Does this mean the US is in the super cup? US already qualified for the World Cup they had already clinched it. That's cool... next summer, I assume? Still haven't made it to a Sporting game, but at least try to get into the WC when it rolls around. So Mexico has to play a Conembol team to get in? World Cup is in Brazil next summer. I read people Tweeted they were naming their unborn children after him. ;) He's one of my favorites so, as part Mexican, I'm happy as a clam. LOL at Mexican Broadcast. Translation below video. "GOOOOAAAAAAL, GOOOALLLL OF THE US…. “We love you! We love you forever and ever! God Bless America! The USA puts us in the playoffs! “It is because of the USA that we are being placed in the playoff ... because of them, not due to you! Not any of you in the green shirts. It was them! Not you! They did it, not you! “Remember this forever. Keep this clearly in mind for the rest of your lives. You do nothing for the shirt, you do not put any effort for the team, you have not placed us in the World Cup, you would not have kept us alive. “It was the US, not you! Not you and your arrogance, not you and your infamy, not you and your punks. "It is a failure … and undeserved. We had no arguments to earn the playoffs. The USA, with subs, with many subs as the visiting team, shows us once against what the USA is all about … how to play this game with dignity, how to approach the sport. “Mexico is a horror, just terrible. A failure. “GOOOOOOALLL [Johannsson scores the winning goal for the US]! GOOOOOOALL of the US! We are in the playoffs! The US did it so we can keep criticizing [Mexico]! Mexico owes us big time. Best sports call of all time?